PDF Multitool PDF Multitool is a multi-purpose tool that enables PDF to CSV, PDF to XML, PDF to XLS, PDF to HTML conversion. 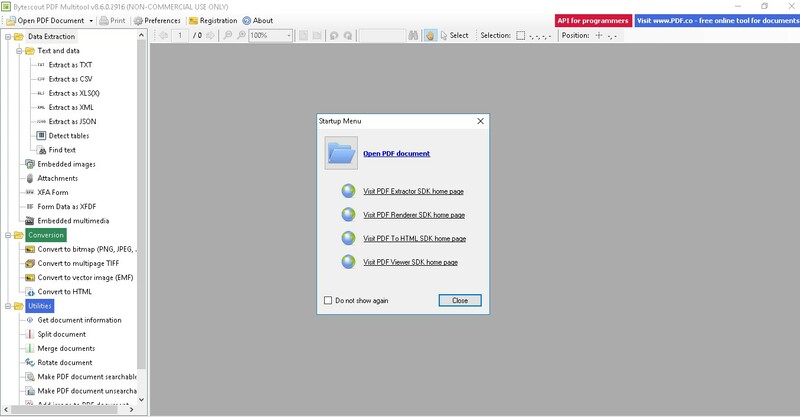 The Portable Document Format (PDF) is a file format used to present documents in a manner independent of application software, hardware, and operating systems. It is the most commonly used file format in offices, schools, colleges, and other places. So most of the users have to deal with these files on regular basis. This makes it necessary for the users to have a software application that can help extract, convert and process PDF files. There are many applications available for this, most of which come with basic functions, none of which works well. PDF Multitool is an easy-to-use and powerful software application, designed to help users extract, convert and process their PDF files. It comes with all the basic functions, along with some unusual ones that can actually be very useful and helpful. The installer size is ~27MB and the installation process is simple and straightforward, taking no time at all. The software installation takes about ~90MB storage space on your drive. After installation, you can easily activate the application with the license code you have, and start using it. The interface of the application is simple and intuitive, and looks more like a PDF viewer when you first look at it. The document viewer frame takes most part of the UI window. To the left, all the functions and features of this application are arranged under three categories in a simple way. There are no complex tabs or menus. On top of the document viewer section, a toolbar contains basic tools like zoom, change page, rotate, search etc. On top, the menu bar contains four buttons only, namely open a document, print, preferences, and about. That is pretty much all there is to say about the UI, it’s very simple with less use of colors, making it easy to use for all kinds of users. Along with all the basic viewer functionality, this tool comes with three categories of tools to process PDF files. Data extraction category contains tools to extract data like tables, text, images, attachments, multimedia, and more. You also have the option to extract PDf files as TXT, CSV, XLS(X), XML, and JSON. The conversion category contains options to convert PDF files to TIFF, PDF to PNG, PDF to BMP image formats easily. You can also convert to multipage TIFF, and EMF vector image, along with the ability to turn PDF files to HTML. The utilities category offers some useful tools and features. There are tools to rotate, split, and merge PDF documents. Moreover, you can make a document searchable/unsearchable, and add and remove text and images to them. PDF Multitool is a reliable and powerful software application that can help users with all most all of their needs when it comes to PDF format files. It offers unusual tools, that are not found in most of the PDF processors. The software runs smoothly and does not run into any error or crashes. Does the .pdf to .xml mean that it will open in Word? That is a key conversion capability for any .pdf toolbox.